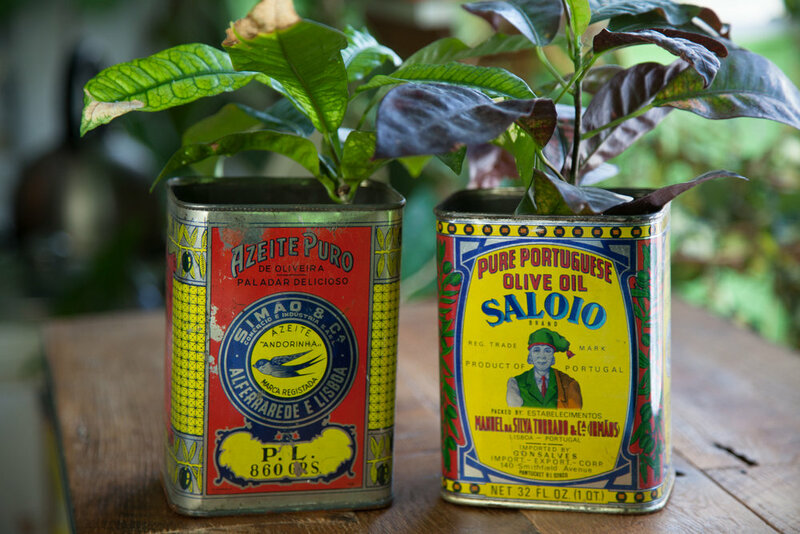 Crotons in upcycled oilive oil canisters. Spider plant in an upcycled coffee canister. Upcycled tea canister garden with succulents. 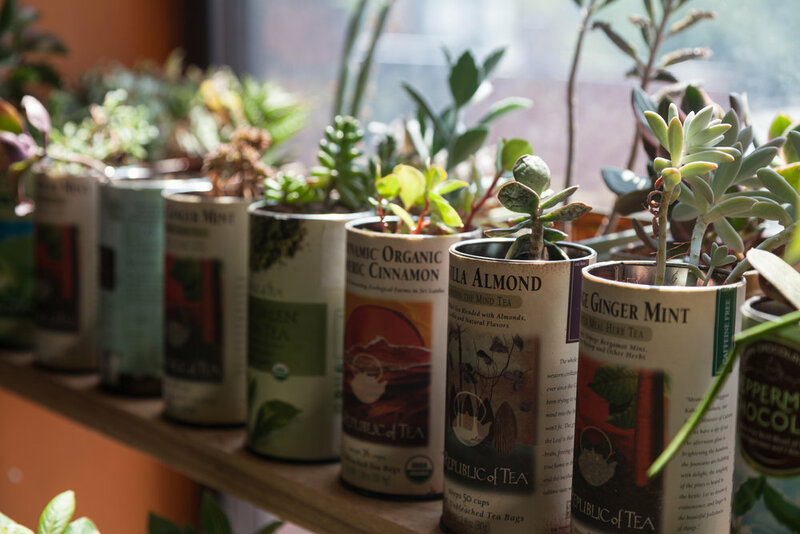 These upcycled tea canister containers are a good reminder to get some plants and drink your tea. Succulent in a upcycled Harney & Sons tea canister. 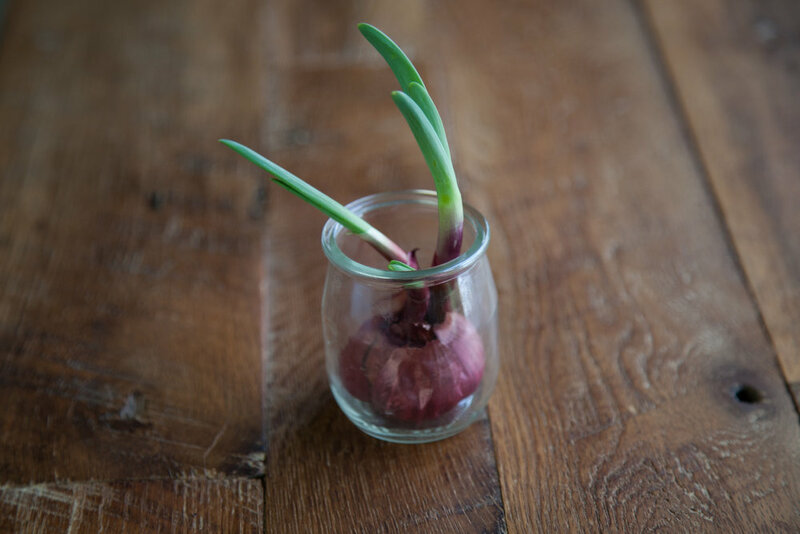 Sprouting onion in an upcycled glass yogurt container. 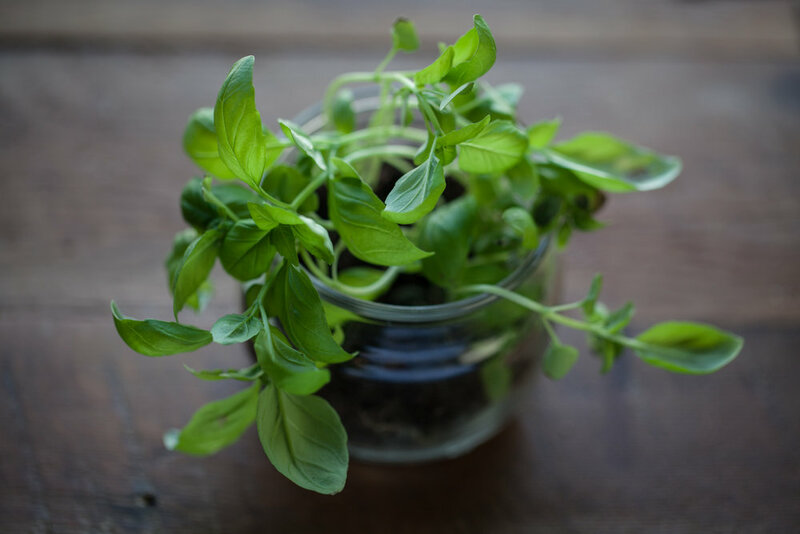 Microgreen basil growing in an upcycled yogurt container. 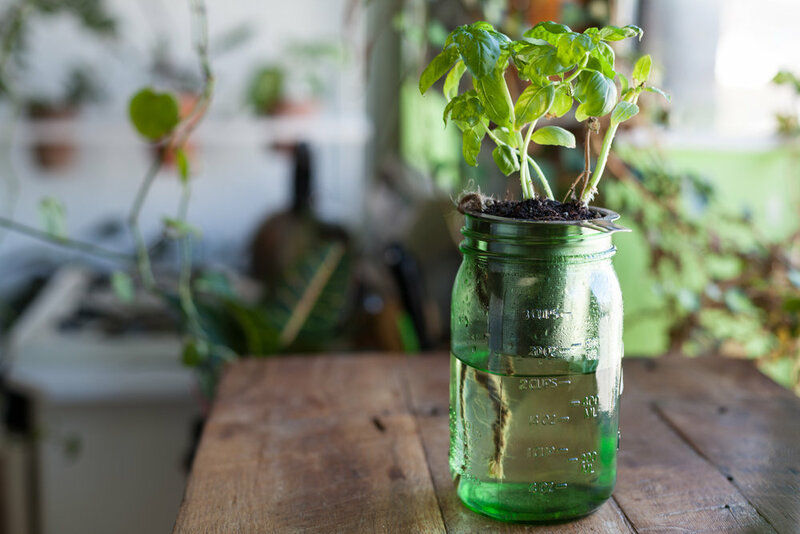 A homemade, self-watering Mason Jar planter. Mason Jar Plant Garden in the kitchen. Vintage ceramic cups and bowls. When I'm heading to the park, I sometimes pop into Junk Brooklyn, which is a fairly disorganized bazaar of knick knacks, trinkets, clothing and homeware. 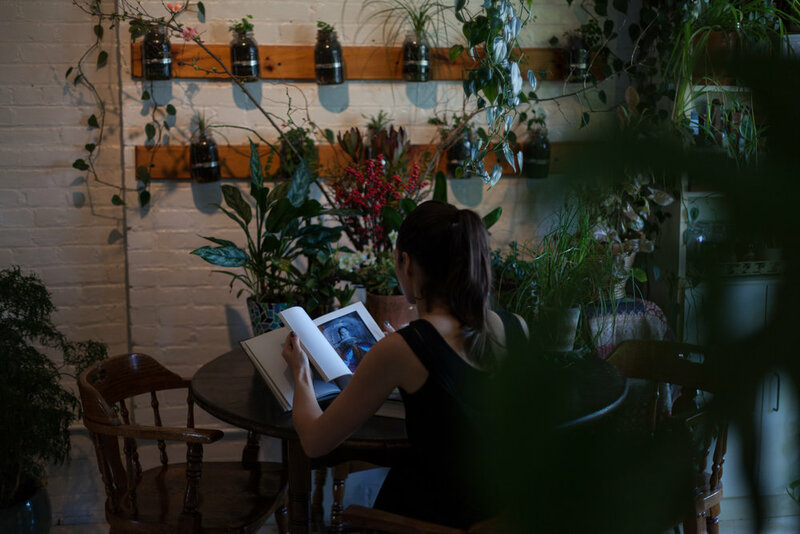 I keep my eye out for beautiful ceramics and jars, and have been lucky to nab a number of beautiful ceramics that could double as cacti or succulent planters. I was particularly pleased to have found a creamer and sugar bowl that had original price tags of $49.99 and for which I acquired for $2.99 apiece. Colander as planter. 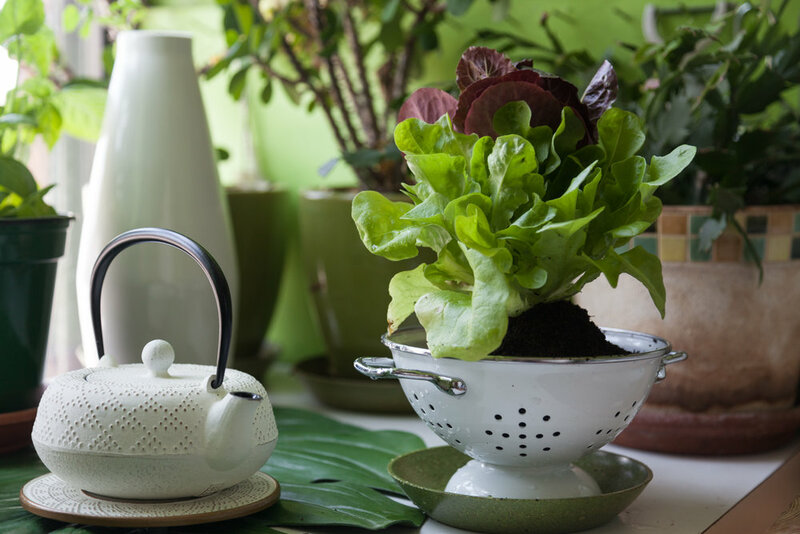 If you are a home cook and go through a number of herbs or leafy greens, but would prefer them freshly picked, then I encourage you to use metal or ceramic colanders as planters. They look super sharp in the kitchen, and the holes in the colander provide for a natural drainage. All you need to do to water them is put them in your sink and give them a little drenching. Sprouted onions in yogurt containers. Sometimes your onions and heads of garlic remind you that you need to get back to cooking—but don’t toss the sprouted ones away. Instead take mini yogurt containers—like these ones I got from Argyle Farms—to display the new shoots. 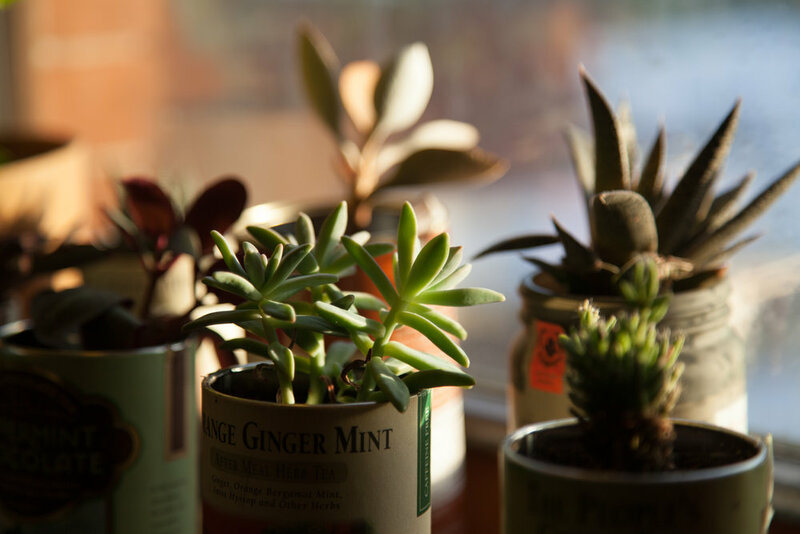 They especially look good on a work desk, bathroom, or kitchen table—and no watering is necessary! Microgreens in yogurt glass. Brendan from Good Water Farms gifted me some beautiful basil microgreens—but WAY more than I could possibly eat, so I took some washed White Moustache yogurt containers and transplanted the microgreens with a prime spot in my kitchen windowsill. Olive oil canisters. If you like to get those big tins of olive oil—don’t toss them in the recycling bin. Instead, upcycle them by cutting the tops off, wash them out thoroughly and use as planters. I found these beautiful ones in the slideshow at a vintage shop next door and planted some Crotons in, which matched the colors of the tin. If you're worried about rusting and drainage, spray a clear Acrylic on the inside and let air out for 48 hours. Next, drill some holes in the bottom and set on a plate, so water can drain freely.